"The electrifying dog is back from beyond the grave"
Frankenweenie is a film about a young boy Victor Frankenstein who is a filmmaker and loves making movies. His dad tries to convince him that there is more to life than filmmaking and science. So Victor decides to take up baseball. After he gets his first home run, he accidentally hits his beloved dog sparky as he was trying to chase it as if he was playing fetch. It killed him and made Victor extremely sad. Victor personally really loved his dog and how he was always with him. Victor was a scientist who loved experimenting very often. So instead of just letting his dog stay dead, he decides to get the body of his dog and bring him back to life with his scientific powers. Because of his great mind, he was able to bring Sparky back to life, but this was just the beginning of it all. He then ends up losing Sparky because he sees a cat and decides to chase the cat the way he normally does. They try to find Sparky, but then Victors friends easily spot him on accident. His friends end up finding out about Sparky because Victor then shows off to everybody at school that they were able to resurrect the dead. The friends decide to invade Victor's lab and they discover the secret tool which helps make the dad animals come back to life. So they all tried to relive their pets for their school fair, but the problem is that even if their pets came back to life, they would come back to life as monsters. They turned into monsters because in the past, Victor took a fish and made it come back to life but it became invisible. The tool they used made their pets come back to life as real life monsters and not normal any longer. They all end up having trouble trying to stop their monster pets from coming back to life. 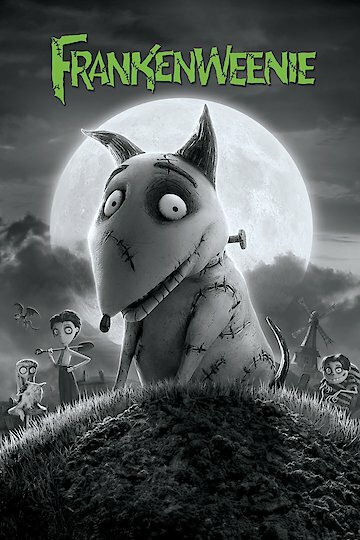 Frankenweenie is currently available to watch and stream, download, buy on demand at Amazon Prime, Starz, Vudu, Google Play, iTunes, YouTube VOD online.